Thanks all. Those were nice fish and a treat on that gin water with full sun. MadGuy... I think there's something wrong with the messaging as I've deleted a bunch (a while back) and can't send PMs either. Or receive them. I also saw a heron yesterday on Badger Mill. Got out today at one of my favorites between Madison and Dubuque and ended up with a baker's dozen of brownies. Nothing as big as yesterday but 4 of them were around 15-16 inches. Actually felt colder today at times than yesterday although there was a window of about an hour around noon when the sun came out and the wind died and it felt like summer. 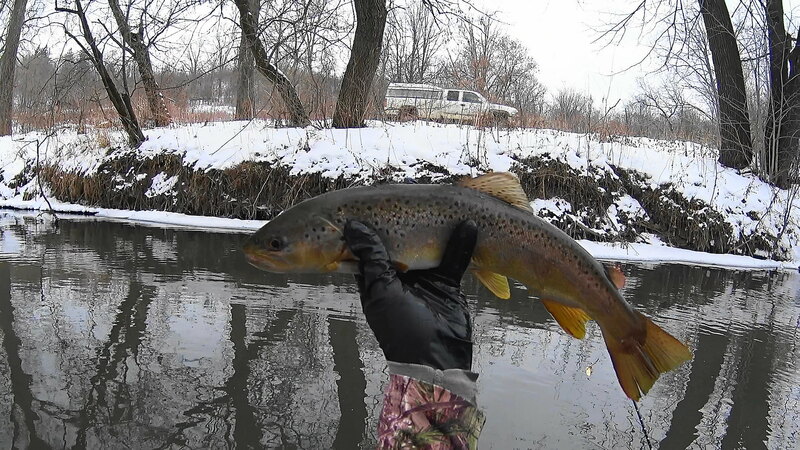 The fish were sluggish in the AM as to be expected and I got 10 of them after noon when I went to a more open, sunny stretch where I assumed the water might warm up a smidge to activate the trout. Great opening weekend for me - best ever in fact. Hope everyone else had fun. PMs aren't working currently, FYI. Ron and I got out today after a couple stops that would have required an auger. About 20 fish in 3 hours - definitely not bad for January! Best fish was a skinny 18" brown for him - we were on a stream he knows like the back of his hand, so he got all the bigs. but I won't complain about the chunky 12s and 13s I got. 2/2 in 2018 so far! An 18"er on a diet. Heading out to the magical place tomorrow. “Eventually, all things merge into one, and a river runs through it. The river was cut by the world's great flood and runs over rocks from the basement of time. On some of the rocks are timeless raindrops."